I took part in Hands Across America. On Sunday, May 25, 1986 my aunt took my little brother into Manhattan to take part in an incredibly historical moment. At that age, we had no clue it was so momentous. All we knew was that we were going into the city to hold hands with strangers in what was called Hands Across America. On the ride in, my aunt told us that people all over the world would be involved. Little did I realize that almost seven million people were involved in holding hands for about fifteen minutes, forming a line spanning 4,152 miles from New York City to Long Beach, California. According to Wikipedia, "Hands Across America raised $34 million, and shortly thereafter, triggered the release of $800 million in aid from the Federal government that had been approved by Congress, but had yet to be released by President Reagan." Organized by activist Ken Kragen, Hands Across America involved celebrities ranging from Dudley Moore to Michael Jackson to John Stamos representing states all over the USA and me, a thirteen-year-old kid from Long Island. The following song "Hands Across America" was played simultaneously on hundreds of radio stations in America at 3 PM EST while everyone held hands. It was amazing! Most of you won't remember this because you're all YOUNG. Lots of familiar (much younger) faces in that video! I remember this. I was 12 and in the 6th grade. I lived in Las Vegas at the time. That *is* amazing. Thank you for reminding me of this. I'm trying to remember if we participated in this? 1986 would have put me in Maryland, in 1st grade, and I remember the buzz about HAA but I can't remember actually going someplace and doing it! I think we practiced it in school, maybe we were doing the real deal! This was just after big events like Band Aid, USA for Africa, Live Aid, and Farm Aid. 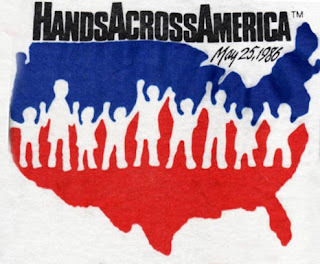 Hands Accross America was organized to bring attention to hunger and poverty in the U.S.. I thought it was a pretty cool event at the time. And I seem to remember it even became the subject (in a positive, supportive way) of one of the Sunday comics . . . Doonesbury, I think. Hi! I was in Los Angeles at the other end of the country. I'm trying to make a map of the route and how complete it was, so if anyone reading this remembers where they were, please go to http://bit.ly/mDdcFp and comment. Yep, I participated too. It went right down my street. Sadly I just remember the song not be as good as we are the world. Hey, I was young! But wow, that was a lot of money! In '86 I was 27 and still in college, married. no kids yet... but I do remember this. I did not participate in it, but it certainly seems like it would have been a great "group-hug-kumbaya" moment. And - I think it would have been cool to be a part of it. It sounds like it was an amazing time, and how cool to be able to say that you were a part of it!